NOTE: Please be advised that Croptoberfest is an adult (21+) only event. Please read the information below or visit our event site here (cannabits.online/croptoberfest). The mornings are starting out crisper and the sun is setting sooner. It’s that time of year again. The fall season is upon us and that means that the cannabis harvest is nigh. That also means that our annual cannabis harvest festival is coming up soon. Since 2014, we have gathered the cannabis industry together in Central Washington to celebrate the cannabis harvest. We celebrate the harvest by throwing a hybrid industry trade show that focuses on delivering approximately 5 hours of education on cannabis cultivation trends as well as hosting sponsored booths that our attendees can interact with. We describe Croptberfest as a popular education that focuses on cannabis cultivation. Every year we create a focused discussion on the agricultural perspective for the nascent cannabis industry. Primarily we focus on cannabis cultivation as well as the standards and policy that this newly commercialized craft has to navigate to bring the finest cannabis to market. Each year we gather together thought leaders and industry members that speak on the functionality of today’s cannabis industry filtered through their particular perspective. There is plenty of audience participation built into the event space and we encourage the folks to ask questions. This year we are proud to present the 4th Annual Croptoberfest in Zillah, Washington on November 4th, 2017. 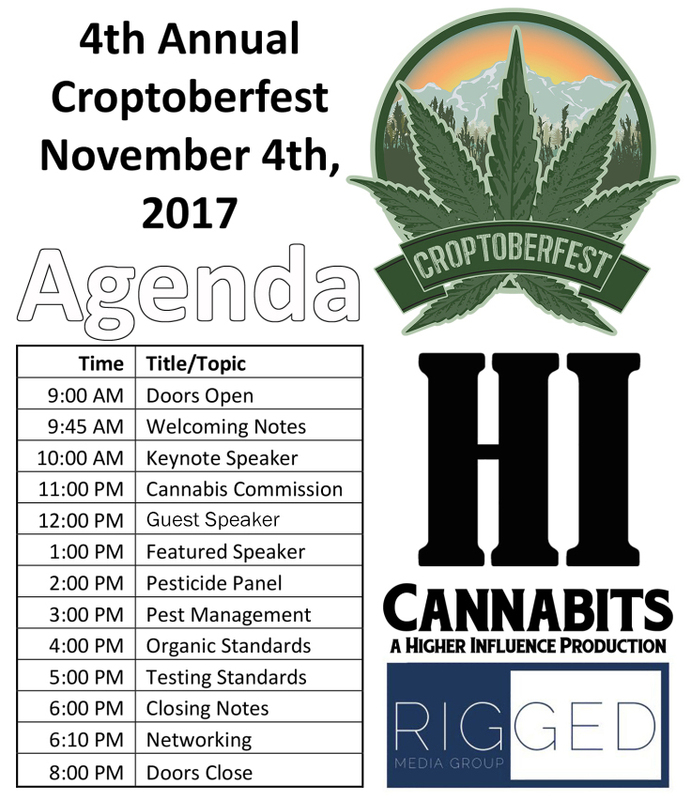 Croptoberfest features over 5 hours of speakers educating about cannabis research, organic cultivation, processing, testing standards, and marketing. This year our event will be hosted in the Perham Hall located at 705 Railroad Ave. Zillah, WA, 98953. The event venue is located in the lower half of a historic building that was originally built during the turn of the century as a fruit packing warehouse. The warehouse was recently renovated into the Perham Hall event venue. Inside the main hall, guests will find a private no-host bar that will serve the attendees with adult libations as well as a conveniently located bar and grill that is just above the event venue that can accommodate folks with food and drink while they are attending Croptoberfest. Attendees will also find free event parking on site. Each year Croptoberfest features the main stage that the entire event is focused around. We are known for gathering together speakers and panelists that discuss today’s cannabis industry. This extensive industry education is the main value that our guests receive. The secondary value is the inspired dialogue that will organically spark up around the educational panels. Our goal is to inspire the industry to gather around our common issues so that we all can find common solutions. Lastly, our event this year will host over thirty booths separated into three activity areas. Each of these areas will have our different sponsors who are both cannabis companies along with ancillary services. During the programmed breaks our guests can visit and survey these offerings while networking with other businesses and industry fellows. Overall, the experience of Croptoberfest provides a unique survey into the here and now of the cannabis industry along with a glimpse into the near future. Doors for Croptoberfest will open for all attendees 9:00 a.m. and this mark the beginning of the event and at that time all three showrooms will be open. The main offering that our event delivers to our guests is the speakers and the educational forums that are constructed to provide information on the cannabis industry through specifically the agriculture focus. This year we will be covering many topics that affect the developing industry such as cannabis policy, commodity commissions, organic standards, testing standards, pesticides and IPM and how all of these affect the cannabis marketplace. Each panelist and speaker will dive into the subject matter and offer the attendees a unique viewpoint from their perspective. At the end of each panel or speaker, we will have reserved time to have attendees ask questions and receive answers from our speakers and panelists. We take organics and sustainability into mind when crafting our event each year. That is why we incorporate as many agricultural voices into the event as possible. Even though we do not advocate for the use of pesticides we understand that they are a functional tool in the toolbox of cannabis cultivators around the world. After all, we are mono-cropping in a quasi-large scale and this has exposed our hybridized crop to heightened levels of pest and disease. It is because of this scenario that we promote education on these chemicals and how to properly apply them. This year we are excited to announce that we will be offering WSDA recertification credits for attendees that have pesticide applicators license. When we started Croptoberfest back in 2014, we knew that we had to throw an event that was similar to the other agrarian festivals that are thrown in agricultural communities across the state. Prior to legalization, no one had ever grown on the large scale that I-502 allowed or if they did they didn’t want to talk openly about it. When Washington State legalized cannabis there was a moment of realization for the entire industry and we saw folks just go for it and plant row after row of strains that had never been mono-cropped to that scale while utilizing the entire strength of the sun. We saw the sungrown cannabis farmers take to the valleys and the hills searching for their little slice of heaven. There is a future for the cannabis industry and we would like to see that potential unfold sooner than later. The cannabis industry will eventually become unshackled when the ability to export to other states and nations becomes legal. It will be at this point that when we will be able to truly express the craft of sungrown cannabis. The future industrial parallels that we point to are with the hop industry. Most don’t know that hops and cannabis are in the same genus or plant family. In fact, hops and cannabis can be grafted together. We draw this future parallel because we know that if Washington State can supply 75% of the nation with its hops demand then we could do something similar with cannabis. Washington State is also a premium wine-producing region. It's the nation's second-largest producer of premium wine and is known as one of the world's top wine regions. Washington is known for its consistent quality, complexity, true to varietal wines. Washington has 13 American Viticultural Areas (the largest being the Columbia Valley). The Columbia Valley covers almost 11 million acres and represents a third of Washington State's land mass; the vast size of the area allows for a number of meso and micro climates. Featuring low rainfall and free-draining soils enable vineyard managers to control vine vigor in order to promote flavor development. Warm daytime temperatures ripen fruit to perfection, while cool autumn nights protect the grapes' natural acidity. Does any of this sound familiar? Well, if you’re a sungrown cannabis farmer then you would see the parallels to wine as well. When we founded Croptoberfest back in 2014, there was actually a ban on cannabis in the City of Yakima. In fact, Yakima County had also passed a ban on the production, processing and retailing of cannabis. So, the vision of our event was to express to the community that even though our industry was being stifled in a regulatory manner we were going to sustain and thrive. It is because of this exposure to resistance that has helped shape the event into what it is today. Our event’s name has part of the word festival in it and that is because we want to inspire a sense of celebration as we bring in another year’s harvest. We use this moment to gather the industry together for a day of education and connectivity and each year we aim to dive deeper into the agriculturally inspired ideas on what post-legalization large-scale cannabis should represent. Are you looking to get the most out of your Croptoberfest experience? The night before Croptoberfest 2017 we will be hosting an exclusive VIP dinner. The VIP Dinner is an invite-only event so you must purchase your ticket well in advance to gain access to the invitation to the private dinner that we have planned. We will be hosting this private event in Yakima Valley and it will feature some of the valley’s finest organic produce that is imbued with hemp. The planned cuisine will be pleasing to even the choosiest of palates. The dinner starts at 6 pm and lasts until 9 pm on November 3rd, 2017. Please purchase your ticket to receive email instructions to attend the VIP dinner.